Who’da thunk it? 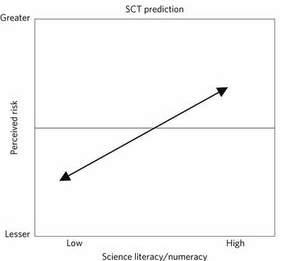 The more you know about science, the less likely you are to worry about “global warming”. One of the great myths is that people are sceptical of the global warming scare because they are scientifically ignorant – people like me for example, with a degree in Engineering from the University of Cambridge. Seeming public apathy over climate change is often attributed to a deficit in comprehension. The public knows too little science, it is claimed, to understand the evidence or avoid being misled. Widespread limits on technical reasoning aggravate the problem by forcing citizens to use unreliable cognitive heuristics to assess risk. We conducted a study to test this account and found no support for it. 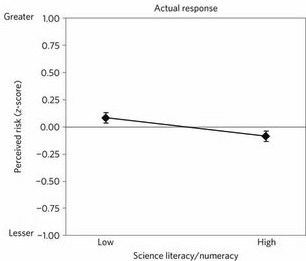 Members of the public with the highest degrees of science literacy and technical reasoning capacity were not the most concerned about climate change. Rather, they were the ones among whom cultural polarization was greatest. This result suggests that public divisions over climate change stem not from the public’s incomprehension of science but from a distinctive conflict of interest: between the personal interest individuals have in forming beliefs in line with those held by others with whom they share close ties and the collective one they all share in making use of the best available science to promote common welfare. So they [warmists] still look at graphs and come to the wrong conclusions then? How could you expect leftists (aka warmists), being the creators and purveyors of PC madness, to look at anything and not come to the wrong conclusions?? I have a PhD in engineering and am a climate realist. By definition any good scientist/engineer is a sceptic rather than a blind believer. No Kevin, they look at where the funding is, and try to think up something, anything, that will get them toward that funding. Funding at universities is a major player !! If the government or other NGO offers money for research, do the Unis say, “yes”, or “no”? .. with all the strings attached. And there is one heck of a lot of funding from the AGW side of the non-debate. Well said Andy! It was always about the money! You forgot to add Andy, that when they do receive any funding, if they come to a conclusion that doesn’t support the AGW theory, they are then instantly branded as corrupted by the money from ‘Big Oil’ (whoever that is) and a new round of funding is created to discredit their work. This is precisely why Prof Flannery and his travelling doom and gloom show are rolled out periodically to put the fear of God into us on Climate Change and the catastrophic consequences if we don’t act now. It is straight out of the Fire and Brimstone/Hellfire preaching manual. However, Flannery’s predictions have had as much Hellfire content as a sparkler and yes, despite what this Government and all their stacked agencies and henchmen may think, people can think for themselves, can go and find out the real facts, are not plebeian masses able to be ‘hoodwinked’ by this scam and scam is the right word for this Tax. It has nothing to do with saving the planet and everything to do with socialism, redistribution of wealth and retaining power. If the US authors had contacted Simon Niemeyer, Will Steffen and about 20 others who orchestrated the Deliberative Democracy “Forum” experiment at ANU in May 2010 they would have been told that you can fool most of the people most of the time but you cannot fool all the people all the time. This was a disgraceful attempt to use propaganda methods to repeatedly tell huge lies (Niemeyer unblushingly described it in his published paper as “Fulmination”) about faux climate science and contrive to prevent discussion to establish whether ordinary Aussies would swallow it. Thankfully a few attendees who saw this gross manipulation and nonsense for what it was (Massive Contrivance) and left the “Forum”. One day Steffen, Flannery and all other members of the Climate Commission will inevitably hang their collective heads in shame. The corruption of climate science knows no bounds. It is demeaning all science. The best advice for genuine and ethical climate scientists is to cease associating with and get out of the clutches of these grant grabbers. If they fail to do so they can expect to go down with the ship called corrupt climate science. Hmmm….. A survey. …… It was a survey that informed us that 97% of working climate scientists supported the AGW hypothesis. It is surveys that inform consensus science – it that isn’t an oxymoron. I don’t suppose you’d consider submitting the survey methodology and metrics for Blog Review? BTW this is a critical friend request. Ah! Read post properly before committing pixels, but lets not fall into the warmist heresy of thinking just because the paper agrees with our prejudices it must be right. The immediate Warmist repost will probably be along the lines of a little knowledge being a dangerous thing. Sceptics just don’t understand the science because they haven’t been given the correct instruction and need more exposure to true science. Bet ya. The notion of AGW is founded upon religion, since so much of it is based on prophecy and not on evidence. It is of little surprise that the educated do not believe in it.